RealAutoTips. - Maybe you ever to drive and know that the steering wheel of your car become heavy than usual. In here you must check that causes of the steering wheel of your car become heavy now than usual. Despite tech power steering, sometimes round in the steering wheel can be more severe than usual. Although very rare, but when it happens, at least not already known cause. Weighing the wheel rotation can be caused by the behavior of the driver itself or also due to other components. The problem is sometimes the cause of the behavior of the driver it is not realized. Often accused of a defect in parts or other components. 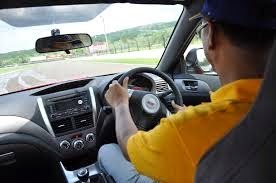 What needs to be considered when the steering wheel suddenly heavy? Must be understood first before changing the dimensions of the tire and the rim, if switching to a much larger dimension, often making the weight of the steering wheel. For example, the standard tire size of 13 inches and a smooth tread, replaced with a size of 15 inches and tires with coarse flowers. This will make the steering feel more. Bald tires can also be made into heavy rotation of the steering wheel. The reason, as with the bald tires, contact area with asphalt becomes more. Unfortunately, this condition is rarely felt by the driver. One reason because it is assisted with power steering. So, if the car has bald tires, in addition prone to rupture also can make more big hand power. Less tire pressures also actually make the steering wheel so heavy. Just as bald tires, these events are often not perceived by the driver. In order not to events, better check the tires and air pressure regularly. Damage to the power steering system also can cause the steering wheel suddenly heavy. In non electric car power steering, suspect the performance of the pump. It may be that the pump has been requested change. Another possibility of oil leakage in the system. Can seal the hose rack steer or outside. While the electric power steering system. Wheel alignment can also affect the movement of the steering wheel. If not aligned between the left and right, then the wheel will pull to one side. When running, obviously wheel can not be bad. Well, wheel alignment is also linked to the legs. If there is less wrong, could have an impact on the steering wheel rotation. Checks should be taken seriously in the garage. Very rarely occurs suddenly, as closely related to the service life of components.